As an organ donor it saddens me to know there are 100,000 people—including nearly 2,000 children— in need of a life saving organ transplant. Join Children's Healthcare of Atlanta throughout April as they celebrate National Donate Life Month. Recognize the generosity of those who have saved lives through organ, tissue, marrow and blood donation. Register with your state (Donate Life Georgia or Donate Life America). 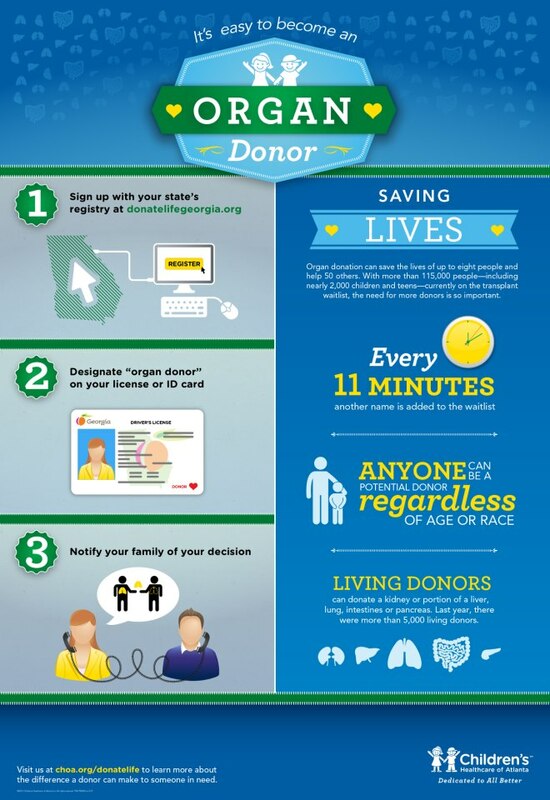 Designate “organ donor” on your driver’s license or identification card. Notify your family members about your decision to donate. If you are under 17 years old, you can join the Donate Life Georgia Registry but, your parents will make the final decision about organ, tissue, and eye donation at the appropriate time.